These last few days at My Sardinian Life | La Mia Vita Sarda have been busy ones. I was awarded with The Liebster Blog Award on September 22nd, and just yesterday I was awarded with The Versatile Blogger Award by sami116 over at The Embarrassment. 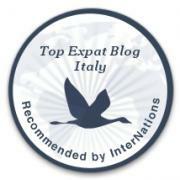 This is My Sardinian Life’s second Versatile Award and I appreciate the effort The Embarrassment took into adding me on their list of great blogs. Without further ado here are seven random facts about My Sardinian Life | La Mia Vita Sarda. I never thought I would publish anything, let alone be awarded with three outstanding blogging awards. I have been a writer since I could pick up a pencil. I still have old poems and songs I’ve written from when I was eight years old. My dream has always been to live by the ocean. I have really big feet. Size 11 by North American standards and size 43 by European standards. My husband and I met. Then ten years and an ocean separated us. I’ve played: soccer, basketball, karate, Thai kick boxing and regular boxing. When I was a kid I wanted to be a jet fighter pilot. And now I must award up to fifteen other blogs with this great award. However, fifteen is a lot and I’ve just given shout-outs from receiving the Liebster Blog Award. Seeing this is my second Versatile Blogger Award I’m going to break the rules. I love scouring WordPress to find new and exciting blogs. I’ve used the helpful Readomattic here on WordPress for sometime and have come across some serious blogs. Right now, in this moment I am going to open the Readomattic and the first five blogs that catch my attention will receive The Versatile Blogger Award. The Penny Farthing – Now in Amsterdam. – Well, snaperiffic. I found a super-duper new blog, that I have subscribed to. The reason I clicked on this link in the Readomattic is because I know what a penny farthing is. And any post titled A Trip to the Beach is a winner in my books. I will be following this Americans adventures in Amsterdam, I suggest you should to. DUFFY THE WRITER – I clicked this wonderful link in Readomattic because Duffy rhymes with Buffy and Buffy used to be a vampire slayer. Then I started to read this blog and I found that they, like me, love Cat Stevens. Plus they live in my favorite city of all time Sydney, Australia. Makes me warm with memories all over again. before you write: lou belcher. The one and only reason I clicked on this link in the Readomattic is because their Gravatar is a sunflower, just like mine. Then I discovered this blog is brilliant! I mean their latest post Getting over yourself – making the transition from thinking to writing is a great post and helped me oodles. This is one blog I’m subscribing to, he’s a freelance writer, editor and coach. A hero in my books. I hope you’ve enjoyed my backwards re-awarding of The Versatile Blogger Award. Great job! What is the reader feature on wp that you are referring to? Never heard of it. It’s under your dashboard called Readomattic. Hot of the press WordPress posts! Thanks so much for the award, I’m honored! And thanks for reading, as well! Wow! Big congrats to you! Jennifer…. Congratulations on your awards and thank you for The Versatile Blogger Award. I’ll be posting about it tomorrow. I’m so glad you stopped by my blog today. I’m adding your to this list I follow. Anyway, I just want to say thanks… your kind words mean so much. Congratulations on another outstanding award. Keep it up! Congratulations on these honors! I won the Versatile Blogger Award last week for the third time. Clearly my versatility is astounding——————- Ha, ha!